After Dunlop pneumatic tires became available for bikes, they were pretty much like the garden hoses they started out as. They were tubular in shape, and were secured to the bike rims by glue, and air pressure pressing them against the rim. The rims were wooden, and has a concave surface for receiving the tube. These tires sometimes came off the rims, and a more secure type of tire was needed. 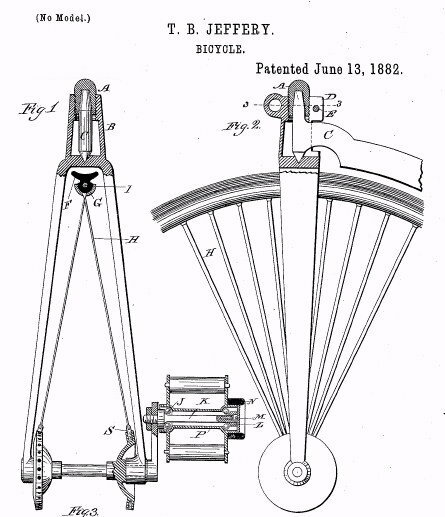 Thomas B. Jeffery was a bicycle manufacturer and inventor, and came up with an improved tire. It was held on by a wire that was embedded in the rubber of the tire, and the wire could be tightened onto the rim. He got a patent on the ancestor of all clincher tires in 1882. This was the ancestor of all clincher tires, which is the kind of tires on most bikes and cars today. Clincher tires today have two wires embedded on either side of the tire, and the wires fit inside the edges of the rim, and hold the tire in place when it is pumped up with air. Jeffery made a velocipede that ran on a railroad, and bicycles with the clincher tire and other innovations he pioneered. The bicycles were sold as the Rambler, and were made in Chicago from 1878 to 1900. 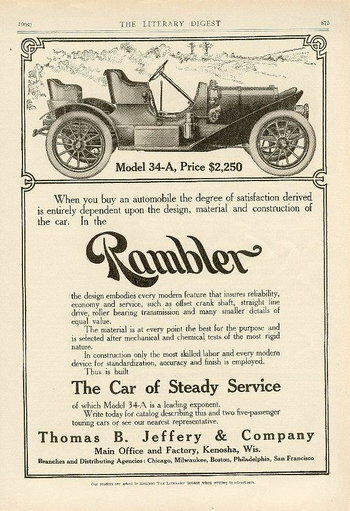 Jeffery later started building automobiles, also called the Rambler, in 1902. 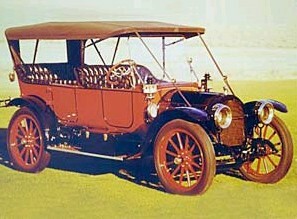 His first car had a 4 cylinder engine, 38 horsepower, with a displacement of 286 cu. in., and sold for $1650, about 8 times as much as a bicycle of the day. The ad is from Vintage Ads 4U. The Jeffery Company became the Nash Company, making Ramblers, and later became American Motor Company, which my Dad bought stock in, so we had one or two AMC cars in the 1960s when I was a kid. How embarrassing. I was pleased at first to see your recent article about Thomas B. Jeffery and the clincher tire. After reading it thoroughly however, I regretfully report it is critically misleading. The problem is that WIRE BEAD TIRES AND CLINCHER TIRES WERE HISTORICALLY DISTINCT, even though the terms are often now used interchangeably. Thomas Jeffery (and also William Bartlett in the UK) invented clincher tires WHICH HAD NO WIRE BEADS. These tires held fast to the rim simply by pressure and the shape of their clincher beads. On the other hand, Charles Welch (in the UK) and A.T. Brown & G.F. Stillman (in the US) are responsible for the wire-bead design we know today. Their design was adopted and popularized by Dunlop, who had introduced the pneumatic tire to the world market only a few years before. Single-tube or "hosepipe" tires (invented by Pardon Tillinghast in the US and I.W. Boothroyd in the UK, and promoted by Col. Albert Pope of Columbia Bicycles) were only ever popular in the US, and only from 1892 to 1933). They were an odd dead-end of local technological development, and their strangle-hold on the American market was all but inexplicable. Elsewhere, wire bead tires dominated the market from day one. See: US Patent #488,494 (A.T. Brown & G.F. Stillman, 1892), UK Patent #14,536 (Charles Welch, 1890), UK Patent #11,900 (William Erskine Bartlett, 1889), US Patents #486,915 and #497,971 (Pardon W. Tillinghast, 1892-1893, and US Patents #434,115 and #466,789 (Thomas B. Jeffery, 1891-1892). 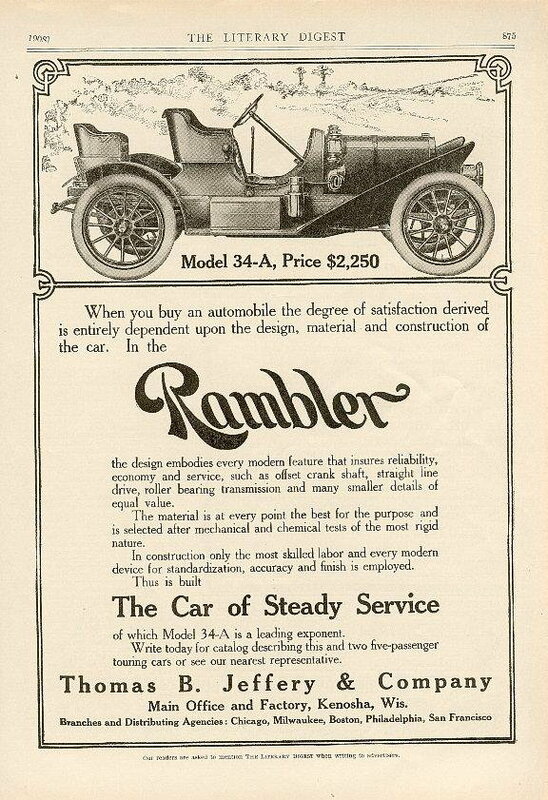 I would like the progression of the type of tires installed on early Fords, (1903-late 20's).